CHESTNUT HILL, Mass. 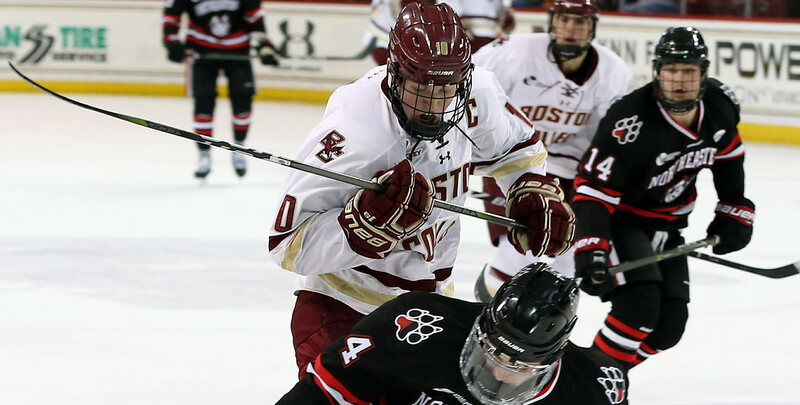 - Boston College's offense erupted during a 8-1 rout of New Brunswick in exhibition action on Saturday night at Kelley Rink. Oliver Wahlstrom and Christopher Brown each netted a pair of goals for the Eagles, who went 3-for-5 on the power play against the Varsity Reds. BC opens the regular season next weekend with a two-game series at Wisconsin. Five Eagles posted multi-point nights, including reigning Hockey East Rookie of the Year Logan Hutsko who collected three assists. The defending Hockey East regular season champions struck quickly to begin the night, scoring twice in the opening 94 seconds of the contest. Ron Greco picked out Graham McPhee for a first-time finish to cap a 2-on-1, followed by a heavy one-timer from Wahlstrom along the left wing. UNB starter Rylan Parenteau was pulled following the rookie's first tally. Christopher Grando finished an impressive passing combination with linemates JD Dudek and Marc McLaughlin at 6:46, slipping a low backhand past Alex Dubeau. Wahlstrom capped the first period scoring on the power play with 47 seconds left in the period off a feed from Hutsko. BC carried a power play into the second period and capitalized less than a minute in with Aapeli Rasanen following a chance from fellow Finnish forward Julius Mattila. Brown registered consecutive goals on either side of the second intermission, and David Cotton concluded the scoring in the third period. Joseph Woll (8 saves), Ryan Edquist (10 saves), and Ian Milosz (10 saves) each played a period in net. Milosz made the night's most impressive save on a sprawling move to the senior's right in the final frame. The regular season begins next weekend (Oct. 12-13) at the Kohl Center as Boston College visits Wisconsin for a pair. Both faceoffs are scheduled for 8 p.m. (ET) between the Eagles and Badgers in Madison.